Campos, Marcelo. “Ketogenic Diet: Is the Ultimate Low-Carb Diet Good for You?” Harvard Health Blog, Harvard Medical School, 6 July 2018, http://www.health.harvard.edu/blog/ketogenic-diet-is-the-ultimate-low-carb-diet-good-for-you-2017072712089. The ketogenic diet is a very low-carb, high-fat diet that involves significantly reducing carbohydrate intake and replacing it with fat. This reduction in carbohydrates puts your body into a metabolic state called ketosis. When this happens, your body becomes adapted to burning fat for energy . It also turns fat into ketones in the liver, which can supply energy for the brain . In one study, people on a ketogenic diet lost 2.2 times more weight than those on a low-calorie, low-fat diet. Triglyceride and HDL cholesterol levels also improved . In fact, research shows that the ketogenic diet is far superior to the often recommended low-fat diet   . This, of course, is the main benefit that people look for when considering the keto diet. Because fat becomes a source of energy, your body actively burns fat when it needs more energy instead of looking for glucose. This is what’s known as being “fat-adapted”. But how does the actual process work according to science? When your body enters ketosis your blood sugar level will drop. This actually gives the fat cells the ability to release the water they’ve been retaining and this is why initially, most people see a big drop in weight loss due to losing water within the first few days. After that occurs the fat cells are small enough to enter the bloodstream and enter the liver where they can be converted into ketones . Hunger is the single worst side effect of dieting. It is one of the main reasons why many people feel miserable and eventually give up on their diets. One of the best things about following a low-carb keto diet is that it leads to an automatic reduction in appetite . The studies consistently show that when people cut carbs and eat more protein and fat, they end up eating much fewer calories. In fact... when researchers are comparing low-carb and low-fat diets in studies, they need to actively restrict calories in the low-fat groups to make the results comparable . Carbohydrates are made up of sugar - a toxic substance that has been proven to be more addictive than cocaine . When your body gets accustomed to intaking a large amount of sugar from carbs, it expects a similar amount of sugar again. When it doesn’t receive the heaping intake of sugar it expects, that’s when your brain sends signals of starvation and intense cravings can occur. Since committing to keto breaks the chain of sugar addiction, it puts an end to the cravings which cause you to make bad dietary decisions. Anyone who has recently switched from a standard western diet to a ketogenic diet will soon notice how their energy levels are stable throughout the day. No mid-afternoon slumps, no cravings for instant sugar or caffeine hits. Fat (and the ketones produced from fat) are a readily available source of fuel. Once someone is fat adapted and in ketosis, they will find they can easily go hours (even days) without food and not have drastic energy level swings . The problem with carbs as an energy source is that they cause your blood sugar levels to rise and fall. Because the energy source isn’t consistent it’s harder for your brain to stay focused and clear for long periods of time. When you’re in ketosis and your brain uses ketones as a fuel source, it has a consistent fuel source that it can rely on which means you can focus for longer periods of time. Multiple studies have found that a ketogenic diet leads to improved cognitive performance, memory function and enhanced learning abilities   . Lowering oxidative stress in the body is one way to increase lifespan . It seems that by lowering blood sugar levels, oxidative stress in turn is decreased . A ketogenic diet decreases blood sugar levels – allowing the formation of ketones to be used as fuel. One theory regarding longevity is that the key to living longer lies in taking care of our mitochondria, as they are responsible for energy production in our cells. Being in ketosis is known to have hugely beneficial effects on the function of the mitochondria by raising the levels of antioxidants in the mitochondria , increasing the number of mitochondria in neurons of the hippocampus (which is crucial for normal brain function) , and by reducing the number of reactive oxygen species, which are damaging to the mitochondria cell structures in high amounts. The studies done on ketosis and exercise performance paint a pretty clear picture – it helps. One of the most detailed studies on fat utilisation and performance (compared to a standard carb diet) was named the FASTER study - the results found that those who were on a ketogenic type diet had more mitochondria than the control group, lower oxidative stress, lower lactate load and that the fat adapted and fuelled athletes could function off fat for a much higher intensity than the non-fat adapted counter parts. Ketosis has been shown to have anti-inflammatory properties while also assisting with pain relief. Reducing glucose metabolism influences pain, so this could be one potential mechanism of action. The science on cholesterol and saturated fat has evolved greatly in the past few decades. It is now accepted that dietary cholesterol does not raise blood cholesterol, and this has even been recognized in the new dietary guidelines. Multiple large meta-analyses have shown no association between saturated fat intake and cardiovascular events or increased mortality. Both prior studies and our research have shown that paradoxically, in the setting of a ketogenic diet, higher dietary intake of saturated fat actually decreases serum saturated fat. In the context of the keto diet, the intake of fat is not only safe - but imperative for long-term cardiovascular health. There have been multiple studies showing that ketogenic diets yield no increase in cardiac events or mortality. Furthermore, cardiac risk factors actually improve on the keto diet, with lowering of triglycerides, improved blood pressure, improved glycemic control, and increased HDL. Controlled studies have consistently failed to show a clinical association between high saturated fat intake and adverse cardiovascular outcomes. With all of the research-proven benefits supporting the conventional keto diet, it’s no wonder why it seems like everyone is praising this low-carb lifestyle these days. But if you’re considering this diet, you’ll probably want to know about the side effects before you decide if it’s right for you. With the start of the keto diet, the body switches from using sugar as a source of energy to using the body’s stored fat. In the process of breaking down fat, the body produces ketones, which are then removed by the body through frequent and increased urination. This may lead to dehydration and flu-like symptoms, such as fatigue, dizziness, irritability, nausea, and muscle soreness which tend to last through the first week of starting a keto diet. The keto diet is also extremely low in certain fruits, vegetables, grains, and legumes that are generally thought of as healthy. Without these foods, people on the diet can miss out on fiber, certain vitamins, minerals, and phytochemicals that only come in these foods. That has significant human health impacts over the long term such as bone loss and increased risk of chronic diseases. Hundreds of studies suggest that diets rich in whole plant foods are linked with significantly lower levels of diseases like osteoporosis, Alzheimer’s disease, heart disease, cancer, and type 2 diabetes. What’s worse is that clinical studies have shown that weight loss reversal is a common side effect of long-term keto diet use. Long-term effects of a ketogenic diet actually showed a reversal in weight loss. During the first week, there was an initial decrease in weight, but after 18 weeks, the weight returned to baseline and started to increase gradually . From a practicality standpoint, restricting your carbohydrate intake to be below 50 grams per day for the rest of your life isn’t a realistic approach to achieving your most optimal state of health. The studies suggest that there are definite short-term benefits of a high-fat ketogenic diet. However, the long-term studies, which are just beginning to be published, are suggesting that keto should be used as a short-term strategy since the risks and reversal of benefits start to surface after eating a keto diet for an extended period of time. But What If There Was A Way To Experience The Benefits Of The Ketogenic Diet Without The Negative Effects? One of the most profound benefits of the ketogenic diet is that it helps break your body’s addiction to carbohydrates and sugar. While it may not be realistic (or clinically recommended) to restrict yourself from carbohydrates for the rest of your life, multiple studies suggest that following a ketogenic diet as a short-term “detox” can not only yield the powerful benefits of being fat-adapted, but also help to break compulsive cravings for carbohydrates. TThat’s exactly why we’ve developed the KETOX Diet Course  the first short-term “carbohydrate-detox” diet program of its kind. The KETOX Diet Course entails a 3-phase nutrition plan that is designed to first deplete the body its of toxic, stored carbohydrate reserves. By detoxing the body of it’s stored glycogen, the metabolism will then be primed to become fully fat-adapted. Once this ketogenic state is achieved, the body shifts to using stored fat for fuel thus unlocking your ability to reach your ideal body and health. The final phase of the program then provides the perfect roadmap for incorporating carbohydrates back into your daily diet, the right way  So that you never have to worry about the weight regain risks that generally follow most restrictive keto plans. Eating less than 50 grams of carbohydrates for the rest of your life isn’t a practical or enjoyable lifestyle. In addition, long term use has been shown through research to pose negative side effects. With the 3-phase KETOX diet plan, you’ll experience the powerful benefits associated with being fat-adapted without risking the long term side effects of prolonged carb-restriction. Most conventional keto diets de-emphasize eating fruits and vegetables which are essential for maintaining optimal health. The KETOX plan includes the keto-friendly superfood drink mix Green Detox to fulfill your vital micronutrient needs. Nutritional gaps from skipping out on fruits and vegetables can worsen the symptoms of the keto flu. Thanks to the detoxifying superfood method, your body will be primed with vital phytonutrients to protect your immunity and fight fatigue-like symptoms associated with keto diets. Restricting carbohydrate intake for long periods of time may lead to muscle and strength loss. Within the KETOX course, you’ll learn how to strategically time your carbohydrate intake to maximize strength and muscle tone. Zero carb diets are notorious for disrupting our mood, mental sharpness and energy levels. With specific macronutrient guidelines inside the KETOX meal plan, each ketogenic meal is tailored toward optimizing your physical and mental abilities. Consuming high amounts of fat and protein as most keto diets suggest can stress the digestive tract. Rich in plant-based fibrous foods, your digestive tract will thank you. As your body metabolically adjusts to burning fat for fuel instead of carbohydrates, impaired sleep often results. The KETOX meal plan provides unique evening recipes catering towards supporting restful sleep. Conventional keto diets allow no freedom to enjoy foods you love. Reward yourself with over 30 different keto-adapted recipes including cauliflower pizza, keto-burgers and sin-free desserts with the KETOX Express Cookbook. Without the proper protocol, incorporating carbohydrates back into your diet after long-term keto use may result in disaster - water weight, bloating and even body fat regain are often reported. The KETOX lifestyle plan makes transitioning back into normal eating easy so that you can eat carbohydrates the smart way while retaining your results. Learn the science of achieving ketosis with the 5-video KETOX digital video seminar series. From answering some of the most controversial questions and myths surrounding keto to covering dozens of carb-hack substitutions, this video series will be the basis for achieving optimal results on a keto diet. The KETOX Course Guide is an in-depth, printable manual consisting of everything you need to know to be successful on the KETOX Diet. You’ll also find the KETOX 3-phase meal plan, which provides you with a step-by-step guide to achieving the ketosis state in a safe, sustainable manner. Consisting of macronutrient breakdowns and customizable meal options, you’ll have never have to do any guess work. To make your transition into keto that much easier, I’ve included my KETOX Express Cookbook. With this recipe guide, you’ll be able to choose from over 30 delicious low-carb breakfast, lunch and dinner options to fuel your keto needs. Plus, an 20 additional bonus recipes for keto-friendly snacks, sides and decadent desserts - following a diet plan has never tasted this good. **Your FREE gift options varies depended the Ketox diet package you select on the next page. Break a sweat and maximize your results with this follow along workout series. Each 15 minute video routine includes live exercise demonstrations, modifications and on-screen timers so all you have to do is simply watch, sweat, and repeat. 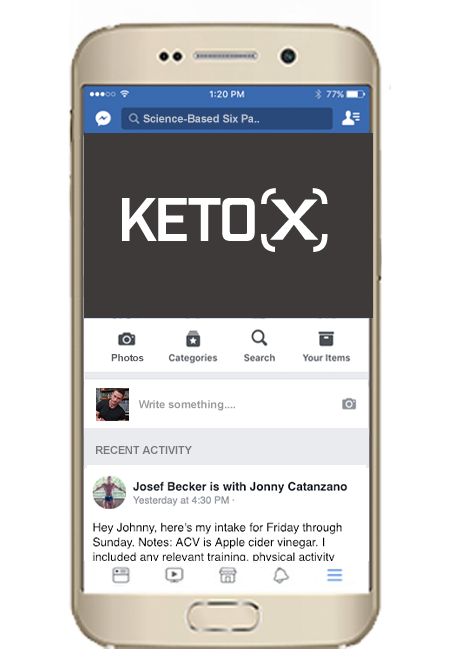 When you sign up with KETOX, you’ll receive instant access to the exclusive Facebook community we’ve built to provide unlimited support and accountability to our members. This private Jumpstart group gives you access to myself and my team of certified coaches and has helped hundreds of thousands lose weight and achieve not only their fitness goals, but their highest quality of life to date. 3 Month Supply of Sugar Free Green Detox - KETO APPROVED! Due to the natural sugar content of fruits & vegetables, most keto diets are often void of the vital micronutrients our bodies require to look and feel our all time best. In step Green Detox  a zero sugar superfood drink mix formula designed specifically for keto dieters which allows you to get a complete days worth of over a dozen plant-based superfoods  without the sugar. Supplying your body with a surplus of vitamins, minerals and antioxidants will give you the nutritional insurance you need to successfully transition into the keto lifestyle. Customizing your keto program to your body’s specific needs are vital for reaching your goals rapidly as you desire. And since everyone is a bit different and has a different starting point, personalizing a diet based on those minor difference needs to be accounted and a key component to your diet when it comes to losing weight scientifically. That’s why you’ll receive a free Ketogenic consultation coaching call to make sure that the program is adjusted and aligns perfectly toward your individualized goals and your unique body. Expedited Shipping for Even Faster Delivery! We'll rush out and expedite the shipping of your order so that you can receive all your Ketox tools lightning fast! 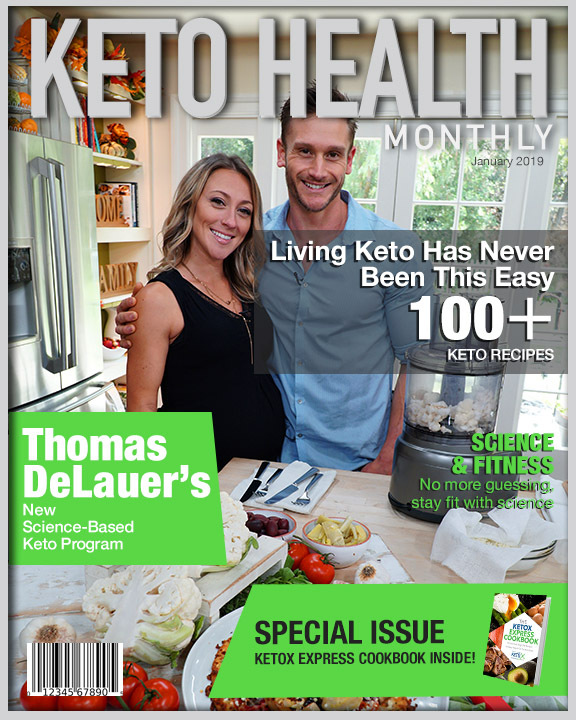 Get Your Ketox Program And Select Your Free Keto Approved Gifts Now! **Your FREE gift options vary depending on the Ketox diet package you select on the next page. At Sixpackabs.com, your satisfaction is our #1 priority. To ensure that you, our valued customer, is completely satisfied with our science-based products and programs, we back every order with a 100% NO-RISK Satisfaction Guarantee. If a product does not meet your expectations, simply email our Customer Care team within 60 days for a full refund of the product purchase price. When will I be able to start using my KETOX Diet Course? As soon as you complete your order, you’ll receive INSTANT access to your complete program through the exclusive member site. The entire course is digital which means you don’t have to wait for DVD’s to be shipped to you. A custom username and password will be emailed to you upon your purchase so that you can get started watching your course videos and reviewing your meal plan in a matter of seconds from your computer or mobile device. What does the ketogenic diet do, exactly? The term ‘ketogenic’ refers to the process of your body (liver) producing organic substances known as ketones. When you greatly limit your carb intake, your body needs to get its energy from another fuel source; in the case of the keto diet, your body starts to utilize fats for energy since glucose is limited. Your body becomes “fat-adapted” and relies primarily on a metabolic process called lipolysis for deriving energy from fats. When your body carries out lipolysis, ketones are made by your liver (as a byproduct). Once ketones are made in high enough amounts, your body enters a state called nutritional ketosis. Being in ketosis has a multitude of benefits for humans, especially for helping burn stored body fat for energy. This makes the keto diet ideal for those trying to lose weight. Is the keto diet safe for me if I have type-2 diabetes? While nothing on this site is intended as medical advice, there is research showing that the keto diet is an effective protocol for people with this condition. Reducing your carb intake (significantly) can enhance your body’s ability to regulate blood sugar, which in turn makes you better at keeping blood glucose levels stable. Nevertheless, you should be sure to keep your physician apprised of any major diet changes if you’re a type-2 diabetic. It’s possible to eat keto as a vegetarian, if a bit more difficult. Remember that keto isn’t about eating a ton of animal protein – it’s about eating a lot of fat. If you can eat eggs and full-fat dairy, you’ll be able to get plenty of protein for keto. Just focus on getting at least some protein-rich foods at every meal and eating plenty of healthy fats, like olive oil and coconut oil. The KETOX Diet Course Guide provides an array of healthy protein options that are plant-based. What about eating out on the keto diet? Most people actually find that it’s not a big problem. There’s something at almost every restaurant that you can have: salads with a generous amount of fat-rich dressing are usually a good bet, and at nicer restaurants you can get delicious fatty steaks slathered in butter or crispy grilled fish with aioli: yum! If your order comes with bread or potatoes or some other carb-loaded side, just ask for a side salad instead. I’ve included a ton of my personal keto substitution options within the KETOX course as well. Since the keto diet is high in fat, won’t that cause intake cause high cholesterol? Research actually suggests the opposite is true. By cutting out carbs and emphasizing high-fat intake (as opposed to increasing carbs and decreasing fat), your cholesterol and blood lipid profiles can improve. It’s important to remember that the fat/cholesterol you consume doesn’t intrinsically increase your plasma triglycerides or lipoproteins. Medium-chain triglycerides (like the fats found in coconut), are digested and utilized for energy rapidly, unlike long-chain triglycerides. Much of the fat you consume on the keto diet will be used for energetic purposes (i.e. maintaining healthy cellular function). How can I deal with carb cravings? Make sure you’re getting enough salt. You need more salt on keto than you otherwise would. If you’re craving potato chips, pretzels, or other salty foods, you might be able to solve the problem completely with some extra salt on your food. Make sure you’re eating enough food. Try adding some extra calories and see if that helps. Make sure you’re getting enough sleep. Poor sleep turns up cravings, especially carb cravings. Although pure alcohol doesn't contain carbs, drinking alcohol has a strong potential to slow down weight loss. Even if there is no sugar, your body can't store alcohol as fat - it has to metabolise it. This means that it will utilise alcohol instead of body fat. That being said, there are many helpful tips included within the KETOX course which covers the best and worst alcoholic beverages to consume while following a keto diet. Is the ketogenic diet suitable for women? Yes! A very-low-carb lifestyle can help regulate blood sugar levels, appetite, improve mood, support weight loss and overall well being. The KETOX Course Guide provides a detailed overview on how women can experience the most success while following a keto-based diet. Are there any simple and tasty recipes for the keto diet? Of course! Included with your KETOX order, you will receive the KETOX Express Cookbook which contains over 30 different breakfast, lunch, dinner, snacks, sides and dessert options to choose from - All of which are 100% keto-friendly. GENERALLY EXPECTED RESULTS FROM OUR SIX PACK SHORTCUTS AND OTHER SPS PRODUCTS: Although our products are intended to be fully implemented, and we work hard to ensure it's easy to do so, the typical user of virtually all education products treats them in much the same way they treat a book. The vast majority read or skim through it once, then do not implement the program or take any recommended action based. The results of our exercise methodology are intangible, and not measured in fat loss, muscle gain, abdominal definition, or other positive results of any kind. And even when consumers implement our product in full, more often than not they do not report increases in fat loss, muscle gain, abdominal definition, or other positive results of any kind. Reports of specific fat loss, muscle gain, abdominal definition, or any positive results of any kind should therefore be understood as the exception rather than the rule. Consumers who use our products can generally expect not to see any increase in fat loss, muscle gain, abdominal definition, or positive results of any kind. It is entirely possible you will gain fat, lose muscle, lose abdominal definition, and experience other negative outcomes as a result of the advice contained in our products. Testimonials found at sixpackshortcuts.com and/or from Mike Chang Fitness are unverified results that have been forwarded to us by users of the Six Pack Shortcuts program, and may not reflect the typical purchaser's experience (as are described above,) may not apply to the average person and are not intended to represent or guarantee that anyone will achieve the same or similar results. If we have disclosed typical results based on information provided to us by a manufacturer or other reputable third party source, you should presume that the typical results as stated are more reliable than the testimonials and other examples found at sixpackshortcuts.com and/or from SPS. However, you should always perform due diligence and not take such results at face value. We are not responsible for any errors or omissions in typical results information supplied to us by manufacturers or other reputable third parties. If a product or service is new, you understand that it may not have been available for purchase long enough to provide an accurate results history. Again, it is possible that even with perfect use of the program, you will not achieve the results described in testimonials. They are meant to be a showcase of the best results the program has produced, and should not be taken as the results a typical user will get. The website’s content is not a substitute for direct, personal, professional medical care and diagnosis. None of the diet plans or exercises (including products and services) mentioned at sixpackshortcuts.com or from Mike Chang Fitness should be performed or otherwise used without clearance from your physician or health care provider. The information contained within is not intended to provide specific physical or mental health advice, or any other advice whatsoever, for any individual or SPS and should not be relied upon in that regard. We are not medical professionals and nothing on this website should be misconstrued to mean otherwise. There may be risks associated with participating in activities mentioned on sixpackshortcuts.com for people in poor health or with pre-existing physical or mental health conditions. Because these risks exist, you will not participate in such diet plans if you are in poor health or have a pre-existing mental or physical condition. If you choose to participate in these risks, you do so of your own free will and accord, knowingly and voluntarily assuming all risks associated with such dietary activities. These risks may also exist for those who are currently in good health right now. [READ FULL DISCLAIMER AND TERMS]. Do you feel like you're in a rut or you've hit a plateau and just can't seem to get back on the bandwagon? Let us help you get started on the path to success with our FREE Science-Based Wellness Newsletter!